WBA super-middleweight champion George Groves says he "will not give up his world title for anything" when he fights Jamie Cox on Saturday. Groves' title is on the line as the British pair meet at the Wembley Arena in a fight that is also a quarter-final in the World Boxing Super Series. "I've worked my whole life to become world champion," said 29-year-old Groves at Friday's weigh-in. Cox, 31, said: "When I look at him, I see a scared man." Groves has won 26 of his 29 fights, while Cox has won all 24 professional bouts. The winner on Saturday will fight in the Super Series semi-finals in January against Chris Eubank Jr, who beat Turkey's Avni Yildirim in three rounds on 7 October. "It's very important for me to win this tournament," said Groves. "I know what needs to be done and I'm feeling very good. "I'm always in exciting fights and Jamie is an all-action fighter. We will see if he wants to run or have a fight. Either way I will win." Groves failed in three attempts to win world titles - against Britain's Carl Froch twice, then in a controversial split decision to Sweden's Badou Jack in September 2015. But he finally secured one when he stopped Russian Fedor Chudinov in the sixth round of their fight in May in Sheffield. Cox won light-welterweight gold at the 2006 Commonwealth Games as an amateur, and has held European and Commonwealth super-middleweight belts as a professional. "This is the first time I've fought for a world title and I've trained very hard and I'm ready for the occasion," added Cox. "The fans can expect a great win." 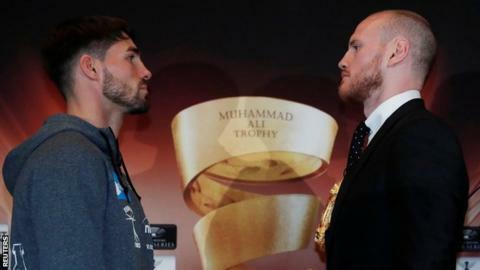 Both fighters made the 12-stone weight limit, with Cox weighing in at 11st 13lb 12oz, and Groves at 11st 13lb 2oz. The World Boxing Super Series has been described as the "Champions League of boxing" with two tournaments, one for cruiserweights and one for super-middleweights. Each category offers a $25m (£19m) prize fund and a trophy named after late boxing great Muhammad Ali, with the winner of each expected to receive $10m (£7.6m) in total over the three victories needed to land the title. World championship belts are also on the line during the individual fights in the new event. This is the third quarter-final of the super-middleweight tournament, with Britons Callum Smith and Eubank Jr already qualified for the semi-finals. Smith will face the winner of the fourth quarter-final between Germany's Juergen Braehmer and American Rob Brant, who fight in Germany on 27 October.